Written by Gerald Mast. The below text was originally presented as a sermon at First Mennonite Church of Bluffton, Ohio and published on Mast’s personal blog in January of 2015. This image accompanies Anna Jansz’s story in the 1685 edition of the Martyrs Mirror. It depicts Anna entrusting her son with a local baker on the day of her execution. In order to find our way into the story of Anna Jansz, we must travel from Zurich, Switzerland in 1525 to the north German city of Münster in 1535. The Anabaptism of Münster and of Anna Jansz differed quite a bit from the Anabaptism of Zurich and of Felix Manz, although they also shared much in common. So, let’s make that journey. Following their public displays of baptismal disobedience in January 1525, Conrad Grebel and George Blaurock joined with other Anabaptist missionaries to preach the restoration of the New Testament church and to establish Anabaptist communities in cities and towns throughout Europe. In the wake of the bloody failure of the German Peasants Revolt during that same year, these Anabaptist conventicles now were the main expression of protest against the corrupted territorial church system and its support for unjust economic practices by the nobility and their political allies. Former revolutionaries such as Hans Hut and Melchior Rinck became Anabaptist evangelists and church planters, preaching that the kingdom of God was becoming visible in a restored church, where members were giving up wealth and weapons in order to live in obedience to the rule of Christ. Melchior Hoffman, a furrier and eloquent Lutheran preacher who became radicalized during time spent among Anabaptist circles in Strasbourg, took the message to North Germany and the Netherlands, where Anabaptist convictions about discipleship, peace, and communal sharing took root in the hearts and minds of men and women yearning for a new day of holiness and justice. Most Anabaptist communities practiced peaceful and voluntary sharing of life and resources in the manner of the apostolic church following Pentecost. But they also anticipated the day in which the just and holy relationships they were experiencing together would take over the whole world, through the powerful and earth shattering return of Jesus Christ, which would be preceded by apostles and prophets proclaiming Christ’s final victory over the godless and the evildoers. In some circles, Anabaptist leaders influenced by Melchior Hoffman’s visions of Christ’s second coming began to teach that it was time to prepare the way for Christ’s return by establishing the New Jerusalem in an earthly city. These expectations eventually became focused in the North German city of Münster in Westphalia, where Anabaptist groups appointed emissaries to travel throughout Europe with an invitation to Christians yearning for a more just and peaceful world. Come to Münster, they urged, where the new day is arriving and justice is being accomplished. As thousands of hopeful radical Christians streamed into Münster to take up residence there, the Anabaptist numbers in the city increased to the extent that the Anabaptists were able to win a majority of seats on the city council during the election in February of 1534. Before long, the Anabaptist majority on the council had abolished private property and appointed deacons to redistribute the city’s wealth to the poor. Infant baptism was abolished and adult baptism was mandated as a requirement to live in Münster. As Catholic and Lutheran Christians fled the city and the Anabaptists celebrated with festivals and preaching services, the prince-bishop of the region laid siege to the city with hundreds of hired soldiers. A long and bloody conflict was about to unfold. The writer of this bold and bitter hymn was a young woman named Anna Jansz. Her story reminds us that the way of the cross includes confusion and conflict; that in baptism we become attached to the broken body of Christ; and that genuine discipleship is indeed costly. Anna Jansz was born in 1510 to a well-to-do family living in the town of Briel on the island of Putten near the North Sea coastline of South Holland. Following her marriage to Arent Jansz, she and her husband accepted baptism in 1534 from Maynaart von Emden, a Münsterite Anabaptist leader who had been sent to Briel to announce the coming of the New Jerusalem in Münster and to baptize converts to the Anabaptist cause. Anna was twenty-four years old when she made the decision to be baptized into a despised and illegal company of radical Christians, a decision that changed her life dramatically. Not long after her baptism a group of Anabaptists marched through the streets of Amsterdam waving swords and announcing that the day of the Lord was at hand. Their goal was to stir up an Anabaptist takeover of Amsterdam similar to what had happened in Münster. 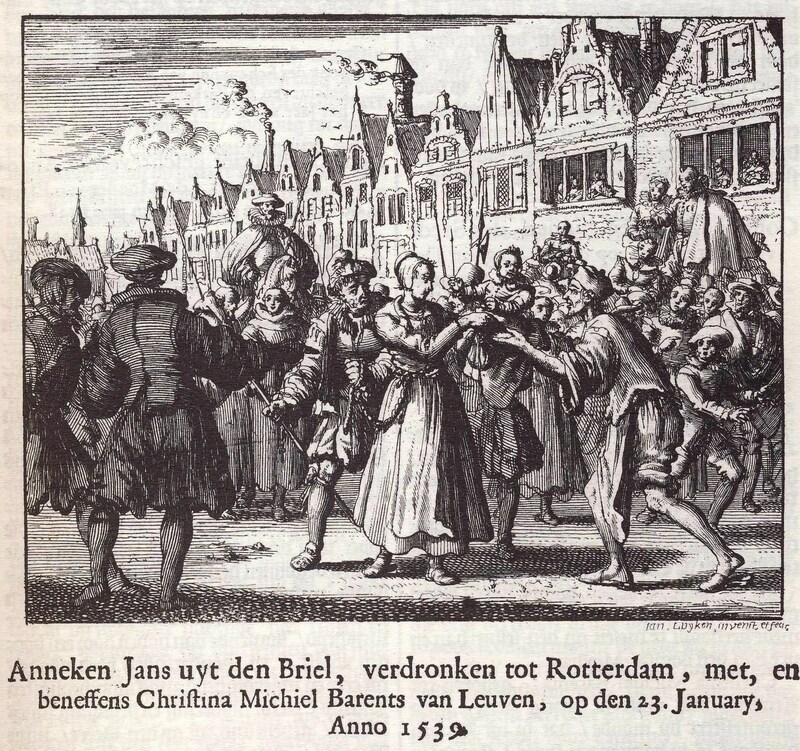 The authorities in the region responded by arresting Anabaptists and their leaders in the cities throughout Holland, including in the town of Briel. As a result of this Anabaptist purge, Anna’s husband fled to England. In the meantime, Anna made the acquaintance of David Joris from Delft, leader of a growing movement of pacifist Anabaptists who rejected the violence of Münster and advocated instead for an inward, peaceful, and spiritual restoration of the way of Christ. The peaceful and more spiritually-oriented vision advocated by Joris became increasingly attractive to many Anabaptists as the Münster Anabaptist kingdom descended into brutal and arbitrary tyranny by its leaders. These leaders eventually established polygamy and required all women aged fifteen or older to be assigned to a husband. This was in a city where women now outnumbered men two to one. Dissenters against polygamy and critics of the city’s Anabaptist leadership were quickly executed and the dreams for a New Jerusalem turned into a nightmare of hunger, starvation, and bloody conflict due to the siege from without and the divisions from within. Eventually, disillusioned Anabaptists betrayed the city to the prince-bishop by passing crucial information about Münster’s defenses to the besiegers outside the gates. The prince-bishop’s armies overran Münster, slaughtering Anabaptists by the hundreds for two bloody days and placing the tortured and broken bodies of its leaders into three iron cages that were then hoisted into the spire of St. Lambert’s Church, where they still hang today as a remembrance and a warning. Like many former Anabaptist revolutionaries whose dreams of a just and holy New Jerusalem were betrayed at Münster, Anna Jansz renounced violence and joined the renewal movement of David Joris. She became a close spiritual friend and confidante of Joris and encouraged him in his leadership. This relationship troubled Anna’s husband, however, and he returned from England to confront what he regarded as an adulterous attachment between David Joris and Anna, and to convince other Anabaptist leaders to investigate the relationship. As a result of an intervention by concerned Anabaptist ministers, Anna apparently followed her husband back to England in 1536, where he disappeared from the historical record, very possibly the victim of the renewed persecution of Anabaptists by Thomas Cromwell in 1538. In any event, Anna returned to the Netherlands in 1538 with her fifteen-month old child Isaiah and an older female companion named Christina Barents; shortly after her return she and Christina were reported to authorities by a fellow traveler who had heard them singing an Anabaptist song. This betrayal led to their arrest and imprisonment. Anna and Christina were sentenced to death by drowning on January 23, 1539. The authorities in Rotterdam carried out the executions the following day. As she was being led to her execution, Anna pleaded for someone in the crowd to care for her son, offering the entirety of her considerable fortune as a reward for raising him. A local baker responded to her request, agreeing to raise her son Isaiah and when he was old enough to give him a letter Anna had written for him while in prison. The Martyrs Mirror account says that the baker who accepted Anna’s son and her fortune became very prosperous, adding two breweries to his holdings, and that Isaiah grew up to be the mayor of the city that had killed his mother. The man who betrayed Anna and Christina to the authorities by reporting their seditious singing, on the other hand, was killed when a bridge he was standing on collapsed while he was on the way to witness Anna’s execution. Anna’s Testament to her son is among the most beloved of the many letters from prison included in the Martyrs Mirror. It was printed initially as a pamphlet that also included her Trumpet Song and it was later incorporated into the first Dutch Mennonite book of martyr stories and hymns—the Sacrifice of the Lord, which was first published in 1562 as a small pocket sized book and went through at least eleven increasingly larger editions. Anna’s Testament appeared as the third entry in the volume, following the account of Stephen’s martyrdom from the book of Acts and the story of Swiss Brethren martyr Michael Sattler. The story was included in all of the many editions of this little book and in the much larger Martyrs Mirror that eventually grew out of this book. In the 1685 edition of the Martyrs Mirror, the editors included not only Anna’s Testament, but also a letter Anna had written to David Joris along with more detail about her life. The 1685 Martyrs Mirror also included the Jan Luyken engraving of Anna giving her son to the baker prior to her execution, found on the cover of our bulletin today. The Swiss Brethren hymnbook, the Ausbund, also included a song attributed to Anna that is a poetic rendition of her letter to Isaiah. My son, hear the instruction of your mother; open your ears to hear the words of my mouth. Behold, I go today the way of the prophets, apostles and martyrs, and drink of the cup of which they all have drank. I go, I say, the way which Christ Jesus, the eternal word of the Father, full of grace and truth, the Shepherd of the sheep, who is the Life, Himself went, and who went this way and not another, and who had to drink of this cup, even as He said: I have a cup to drink of, and a baptism to baptized with. Having passed through, He calls His sheep, and His sheep hear his voice, and follow Him wherever he goes; for this is the way of the true fountain. This way was traveled by the royal priests who came from the rising of the sun, who entered into the ages of eternity and who had to drink of this cup. This way was traveled by the dead under the altar, who cry, saying: Lord, Almighty God, when will you avenge the blood that has been shed? This is the way in which walked the twenty-four elders, who stand before the throne of God, and cast their crowns and harps before the throne of the Lamb, falling down upon their faces, and saying: Lord, unto You alone be praise, glory, and power, and strength, who shall avenge the blood of your servants and ministers, and shall through yourself gain the victory. Great be Your name, Almighty, which was, and is, and is to come. My son, if you desire to enter into the regions of the holy world and into the inheritance of the saints, follow after them; search the Scriptures, and it shall show you their ways. The angel who spoke to the prophet said: A holy city has been built, and set upon a broad field, and is full of all good things; the entrance thereof is narrow, and set in a dangerous place to fall, like as if there were a fire on the right hand, and on the left deep water, and only one path between them both, even between the fire and the water. See, my son, this way has no retreats; there are no roundabout or crooked little paths; whosoever departs to the right or to the left inherits death. Therefore, my child, do not regard the great number, nor walk in their ways. But where you hear of a poor, simple, cast-off little flock, which is despised and rejected by the world, join them; for where you hear of the cross, there is Christ. Flee the shadow of this world; become united with God; fear Him alone, keep His commandments, observe all His words, write them on the table of your heart, bind them upon your forehead, speak day and night of His law and you will be a pleasant tree and a sprout in the courts of the Lord, a beloved plant growing up in Zion. Take the fear of the Lord to be your father, and wisdom shall be the mother of your understanding. Do not be afraid of people, forsake your life rather than depart from the Truth. Honor the Lord in the works of your hands, and let the light of the Gospel shine through you. Love your neighbor. Deal with an open, warm heart your bread to the hungry, clothe the naked, and do not tolerate having two of anything, because there are always those who are in need. All that the Lord grants you from the sweat of your brow, beyond that which you need, share with those who love God. O my son, let your life be conformed to the gospel, and the God of peace sanctify your soul and body, to his praise. Amen. Martyrs Mirror. First English translation by I. Daniel Rupp. Lancaster, Pa., David Miller, 1837. (since this translation is based on the 1748-49 German translation, which was based on the second Dutch edition of 1685, it includes more detail about Anna’s life, including her letter to David Joris) pp. 379-82. The engraving by Jan Luyken depicting Anna giving up her son Isaiah for adoption prior to her execution is found in the 1685 Dutch edition (II:143) . Martyrs Mirror. English translation by Joseph Sohm. Scottdale, Pa.: Herald Press, 1985 (The English translation currently in print was first published in 1886 and is based on the 1660 Dutch edition, which only included Anna’s Testament) pp. 453-54. The Anabaptist Writings of David Joris. Gary Waite, trans. and ed. Scottdale, Pa.: Herald Press, 1994. (This collection of writings includes an anonymous biography of David Joris that describes the relationship between Anna and David Joris) pp. 51-52. Profiles of Anabaptist Women. C. Arnold Snyder and Linda A. Huebert Hecht., eds. Waterloo, Ont. : Wilfred Laurier University Press, 1996. (This book includes a profile of Anna Janz by Werner Packull that puts many of the details about Anna Janz together in a coherent way. There is also a new translation of her letter to David Joris and a translation of three verses from her Trumpet Song) pp. 336-51. Elizabeth’s Manly Courage: Testimonials and Songs of Martyred Anabaptist Women in the Low Countries. Hermina Joldersma and Louis Grijp, eds. and trans. Milwaukee, Wis., Marquette University Press, 2001. (This book includes a complete translation of Anna’s Trumpet Song) pp. 56-73.